Defend your submersible pump and water system from the abrasive, damaging and costly effects of sand with a Lakos SUB-K Pump Protection Separator. Using controlled centrifugal action, troublesome sand is removed from the water before it enters the pump, reducing wear to impellers and other vital components. Manufactured using state-of-the-art injection molding techniques and industrial strength composite materials, the SUB-K features no moving parts to wear out, no screens or filter elements to clean or replace and requires no routine maintenance. Trouble-free and effective, Lakos SUB-K Separators are easy to install into water wells as small as 6" I.D. 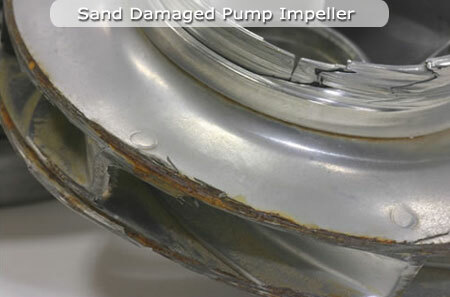 Reduces sand abrasion wear to pump impellers and other components, EXTENDING the pump life 5 years or more. Where does the sand go? Purged sand begins to accumulate in the bottom of the well, blocking some of the casing perforations and changing the incoming flow characteristics. An "equilibrium" is achieved, keeping excessive sand from entering the well. The natural movement of underground water just as easily moves some sand out of the well as it does into the well.